Bryce Canyon's beautiful limestone/sandstone rock formations are due to erosion. It is not just a single canyon, but many small ravines which have formed, over time, the many fragile cliffs and spires that make this such an interesting place to visit. 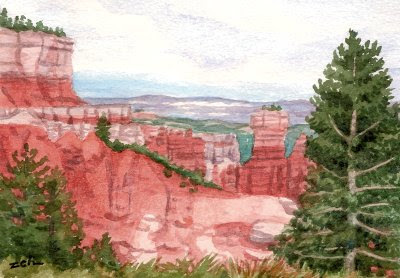 This painting shows one view of the canyon. You can see the layers of color - pale pinks and reds. In the far distance is a valley with some low hanging clouds. I believe beyond that valley lies the Grand Canyon. I am always amazed at how trees and other vegetation can grow in the most difficult circumstances. Some of these trees are growing at the very tops of cliffs that are razor thin. The vegetation is most likely what is keeping the formations in place as with wind and weather, they will erode further. Beautiful and fascinating!